Super Typhoon Nepartak approaches Taiwan, threatening flooding. 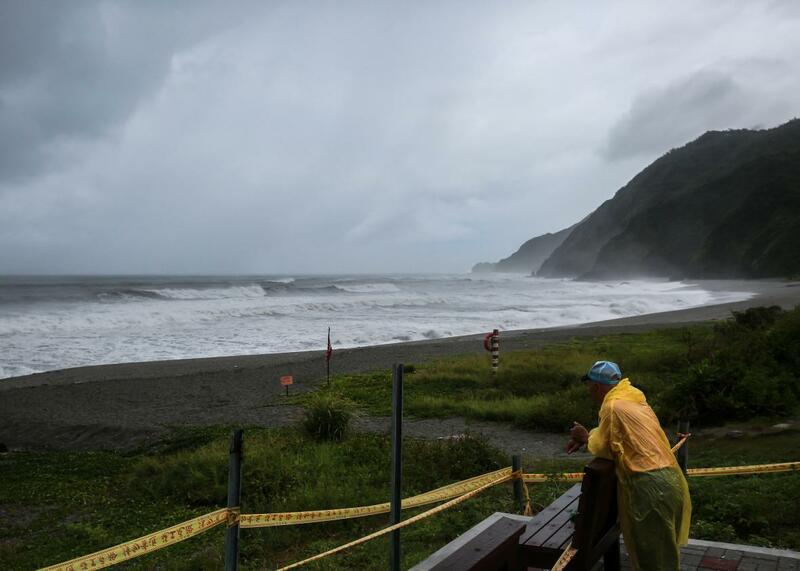 A man watches the waves as Super Typhoon Nepartak approaches the east of Taiwan on July 7, 2016 in Yilan, Taiwan. A meteorological monster, Super Typhoon Nepartak is bearing down on southern Taiwan with almost unseen ferocity. It should make landfall in just a few hours, around 7 a.m. local time. Typhoons aren’t particularly unusual this time of year in Taiwan, but this one is special. That may be because the waters that Nepartak has been traversing are some of the most unusually warm on the planet right now, running about 2 degrees Celsius warmer than normal for early July. Earlier this week, Nepartak rapidly intensified from a tropical storm to the equivalent of a Category 5 hurricane, the strongest category on the Saffir-Simpson scale, in about 24 hours, and has maintained that top-level strength for about two days. (A ‘hurricane’ and a ‘typhoon’ are different names for the same thing. ‘Tropical cyclone’ is the generic term for storms like this, but since Nepartak is in the western Pacific Ocean, it’s also called a typhoon.) Earlier on Thursday, the center of Nepartak made a direct hit on a Taiwanese weather buoy, producing wind speed readings that were literally off the charts. Thanks to Nepartak’s large size and Taiwan’s unique geography, some parts of the island could see as much as 52 inches (1,330 mm) of rainfall over the next day or so. Taiwan’s coastal mountains, along its east coast, will help enhance rainfall intensity as a firehose of tropical moisture is forced upward and squeezed into raindrops. It’s really hard to imagine that much rainfall that quickly—it’s more than New York City receives in an entire year. This exact situation can produce some of the heaviest rainfall rates on Earth. The coming deluge is likely to produce tremendous inland flooding, typically the biggest problem that results from a typhoon in Taiwan. The country’s defense ministry has placed thousands of soldiers on standby, and schools, train stations, and airports have also been shuttered in advance of the storm. Two outlying islands have been evacuated. Nepartak’s landfall will be in southern Taiwan, an area that regularly experiences tropical cyclone strikes and has a limited risk of inland storm surge, but is sure to see widespread devastation over the next day or two. Taiwan Power Company, the state-owned electric utility in Taiwan, estimates 3.1 million homes will lose power. But rain isn’t the only story: Ocean waves of up to 42 feet (12.8 meters) will batter Taiwan’s rugged eastern coast, and momentary wind gusts could approach 195 mph (315 kph) just before landfall, according to the latest forecast from the Joint Typhoon Warning Center. Meteorology students should take note: Nepartak is about as bad as it gets for one of the most typhoon-prone places on the planet. Since accurate Pacific records began in 1971, there has been only one other storm as strong as Nepartak to make landfall in Taiwan—Super Typhoon Bilis in August 2000. In a typical year, only three or four storms as strong as Nepartak form on Earth. But Nepartak is already the third category 5 storm of 2016. There’s been a string of intense tropical cyclones in recent years, especially in the Pacific. Last year featured a record 25 storms of category 4 or 5 strength globally, shattering the previous record of 18. Thanks in part to warming ocean waters, an increasing prevalence of the strongest categories of storms has long been theorized by scientists as a result of climate change. That’s because the entire environment in which these storms form is changing: Warmer oceans means more water vapor is available to fuel the storms’ intensification, and rising sea levels mean more coastline will be inundated when they hit.